New York: Random House. As New in As New dust jacket. 2008. First Edition; First Printing; Signed by Author. Hardcover. 0375505105 . A most impressive first edition/first printing in unread As New condition in like half-wrapper. This copy is signed by author and Photographer Annie Leibovitz directly on the title page; "The first thing I did with my very first camera was climb Mt. Fuji. Climbing Mt. Fuji is a lesson in determination and moderation. It would be fair to ask if I took the moderation part to heart. But it certainly was a lesson in respecting your camera. If I was going to live with this thing, I was going to think about what that meant. There weren't going to be any pictures without it." 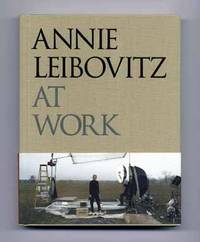 - Annie Leibovitz. The most celebrated photographer of our times talks about and shows how she made her pictures; Photographs .